Just like Marmite, you’ll either love or hate the latest offering from Tom & Serg. 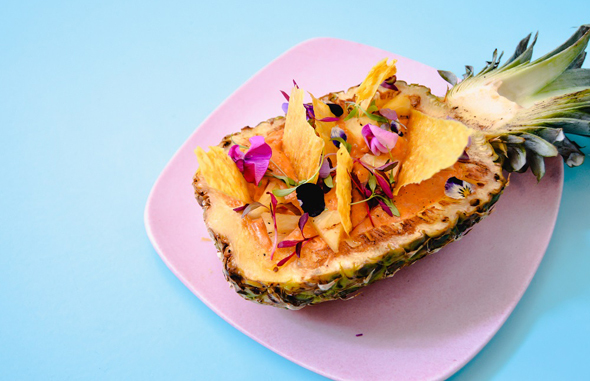 Tacos served atop a porcelain chihuahua and prawns nestled in a scooped-out pineapple, all eaten off plastic plates emblazoned with bananas: this is Mexican cuisine, Tom & Serg style. The latest from the lads is hidden behind the unassuming lobby of a budget hotel near Safa Park. 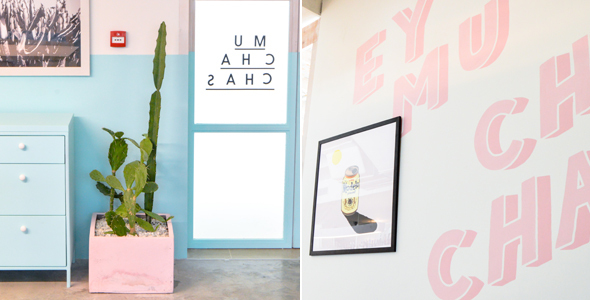 Once inside, the vibe is more Byron Bay than Buenavista – think lashings of aqua, polished concrete floors and cacti in pink pastel pots. 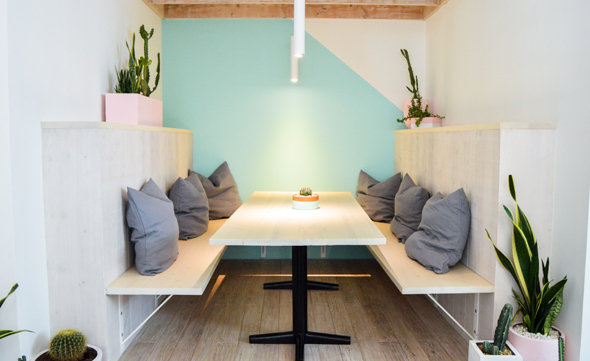 Pastel pinks and blues – kind of like a nursery, but it works. As we perched upon our wire chair, our waiter Dennis looked us deeply in the eye – “I’m here to help, anything you need just tell me.” He meant it. He anticipated our needs and made great recommendations. The Dhs225 Fiesta Menu is a set meal of ‘staff favourites tailored to your tastes.’ It’s also open to alterations for food allergies. Both the chicken quesadilla (Dhs42) and the chicken taco (Dhs29) are dotted with charred pineapple to add a touch of sweetness (just like a Hawaiian pizza – which you’ll either love or hate). There was even a pineapple randomly resting on our table – a plea for a Snapchat perhaps? The ingredients were inventive and fresh – slices of fennel drooped over our salmon ceviche (Dhs75), while radish and pickled onion topped the mini Mexican quiches called sopes (Dhs42). 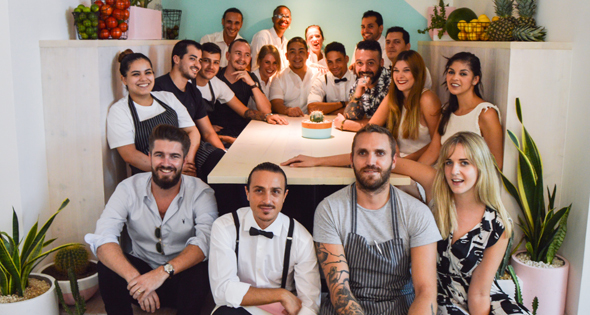 The desserts were particularly quirky – a coconut popsicle (not on the menu) came with jelly wobbling on an actual watermelon rind, while the perfectly-undercooked churros (Dhs39) were served with an incredibly tangy lemon candy floss and eggy flan. My date said he would have preferred the churros and rich chocolate sauce without the weird accouterments. Meanwhile I loved the added interest. Basically, some people will dig Muchachas, others won’t. It’s a bit of a Marmite and that’s okay. One thing must be pointed out: if you only want tacos, Muchachas might be a let down when comparing them to others in town. La Tablita in Oud Metha, for example, serves firmer, less soggy taco shells at a cheaper price. On the other hand, if it’s a night out with friends in an environment that doesn’t feel an ounce stiff, Muchachas is the way to go. Yes, we do struggle with the price of Dhs29 for a single taco (at La Tablita they’re Dhs15 a pop), but there’s no denying we’ll be back at Muchachas soon, probably on a day in which we’ve sipped on a flat white from Common Grounds and made a sandwich with sourdough from Sum of Us. Prices aside, these two men and their team have worked to elevate Dubai’s food scene – their sense of branding and attention to detail is second-to-none. They create brands that people want to be a part of and they’re making other Dubai F&B operators pick up their game. And that’s something we’ll always love.